Many United States residents whose relatives live outside the country want to reunite with their families. The immigration practice at Coleman Jackson, P.C., helps bring spouses, siblings, parents and other close relatives together through family immigration petitions. The experienced family immigration attorney and staff at our Dallas, Texas, law firm employ a comprehensive, caring and confidential approach to learn about your family situation, analyze options and opportunities, advise you and pursue options that may help you achieve your goal. Petitions for family immigration can be either immediate relative petitions or preference relative petitions. Immediate relative petitions:A person qualifies as an immediate relative if he or she is the spouse of a U.S. citizen, child of a U.S. citizen or parent of a U.S. citizen, if the citizen is at least 21 years of age. A child in immigration law means a person who is unmarried and under 21 years of age at the time the petition is filed. 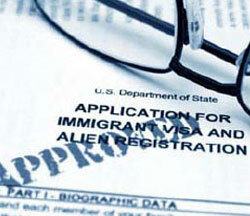 A visa is immediately available for immediate relatives, but the application process may take several months. Preference relative petitions: Family members who do not qualify as immediate relatives or fiancé(e) may be able to immigrate through the preference system administered by the U.S. State Department. Certain relatives of green card holders may also immigrate under the preference system. If you file a preference relative petition on behalf of your loved one, your relative will have to wait until a visa number becomes available. The priority date may take years before a visa becomes available. After the wait, the spouse and children of preference system immigrants are permitted to immigrate with them as derivative beneficiaries. you contact our law office for assistance with an immigration issue, we will ask you detailed questions about you and your family so that we can conduct a thorough analysis of your situation and help you file the proper petition and supporting documentation based on the law and on your individual situation. If neither an immediate relative nor preference relative petition is appropriate for you, we may be able to assist you with other options, including immigration options for spouses who have been involved in domestic abuse or are crime victims or asylees. To schedule an appointment, call 214-599-0431 or contact us online.